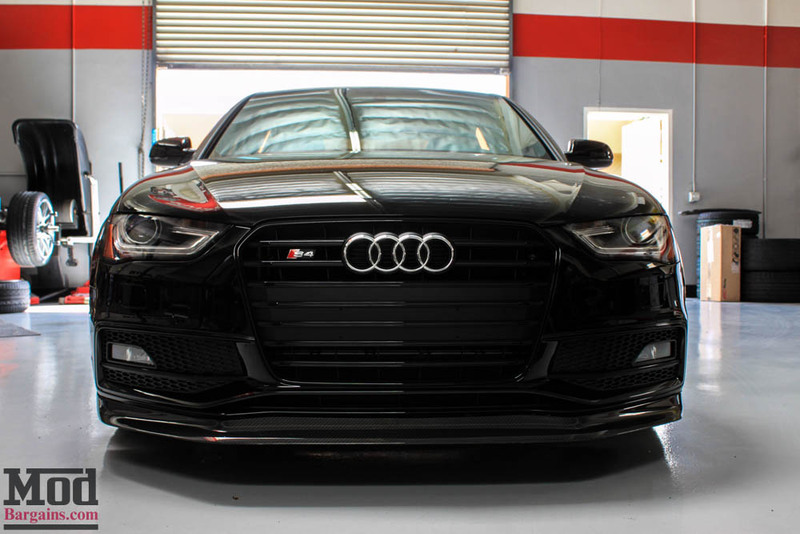 We love seeing cars with a different look here – and this B8.5 Audi S4 came in wearing a really clean Carbon Fiber Front Lip from Endless that really spiced up the B8.5 Audi S4 exterior. 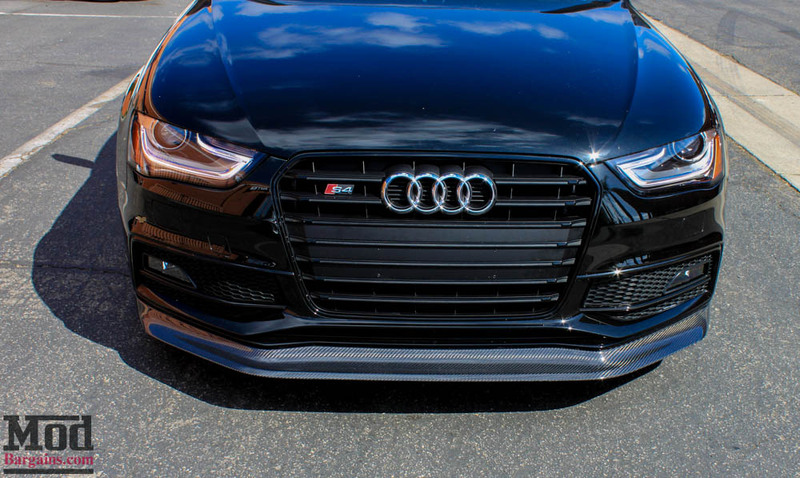 The CF lip gave it a hint of aggression, but the OEM ride height left something to be desired in terms of the aesthetics of this S4. 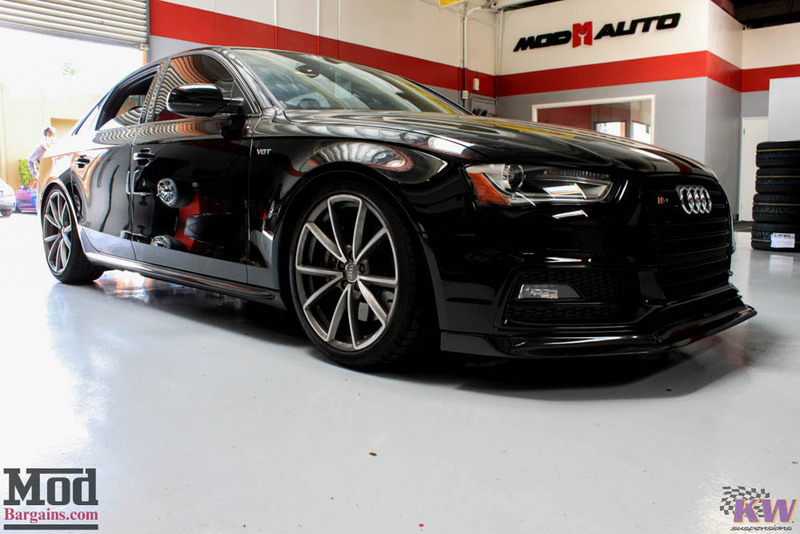 ModBargains Co-Founder Ron Hay stepped in to help out with this one to get the Audi riding nice and low. 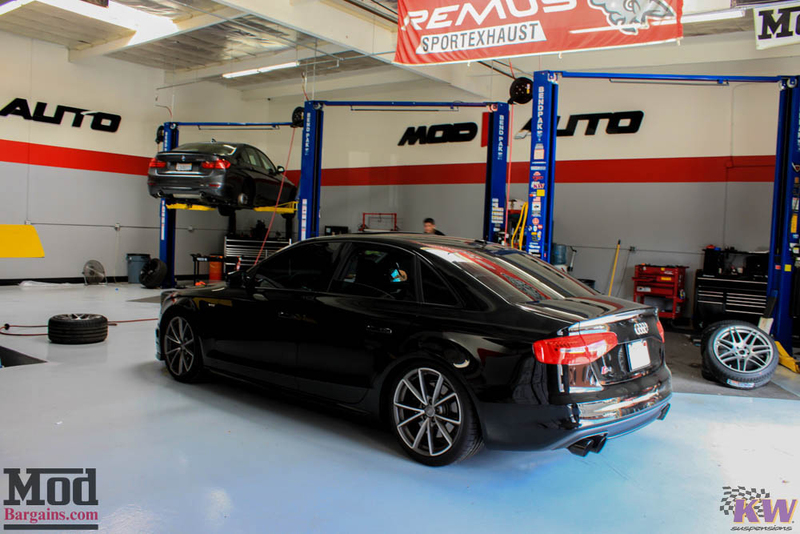 We got the B8.5 Audi S4 into the Mod Auto shop and our techs had the car in the air with the wheels off before we could say “Bob’s your Uncle”. 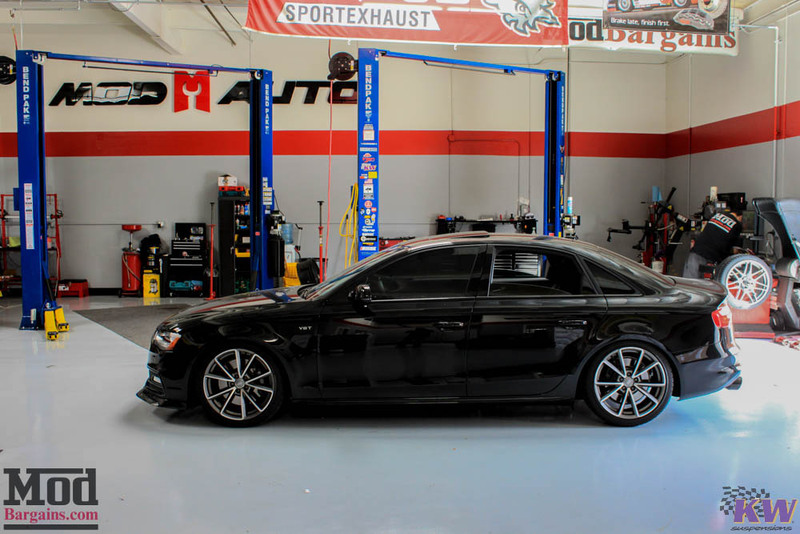 In order to give the S4 the drop the owner was looking for, Ron recommended a set of KW Suspension V3 Coilovers for Audi B8.5 S4. 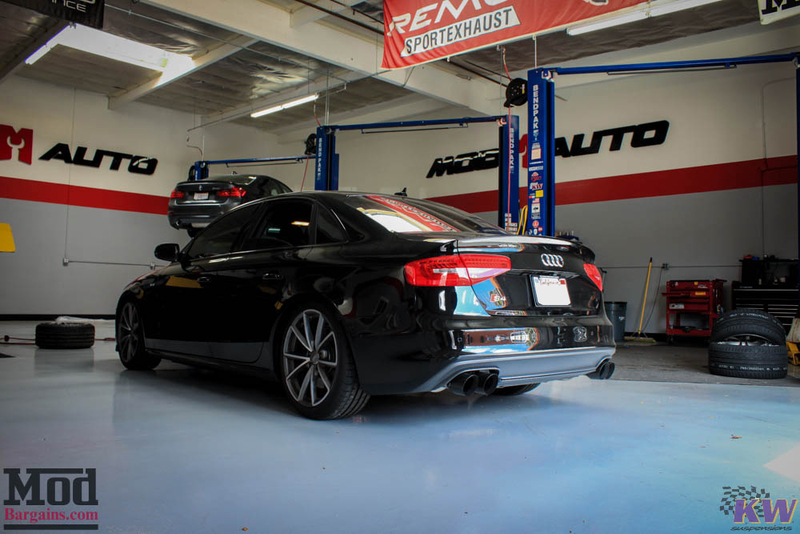 On the S4, the KW Coilovers offer a drop range of 0.8 – 1.5 in up front and 0.4 – 1.5 in of drop in the rear. 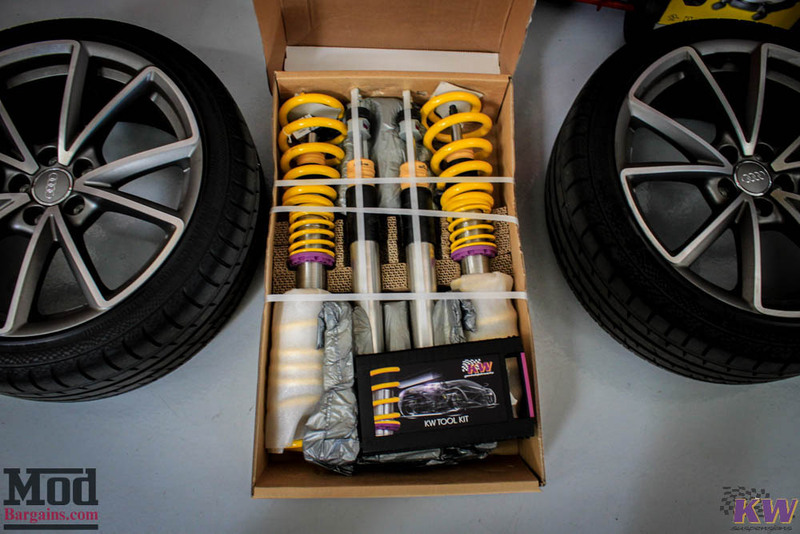 The owner of the S4 opted for Variant 3 for his KW Suspension Coilovers – V3’s offer adjustable rebound and compression damping as well as adjustable ride height, and KW Coilovers feature a corrosion-resistant Stainless Steel finish. 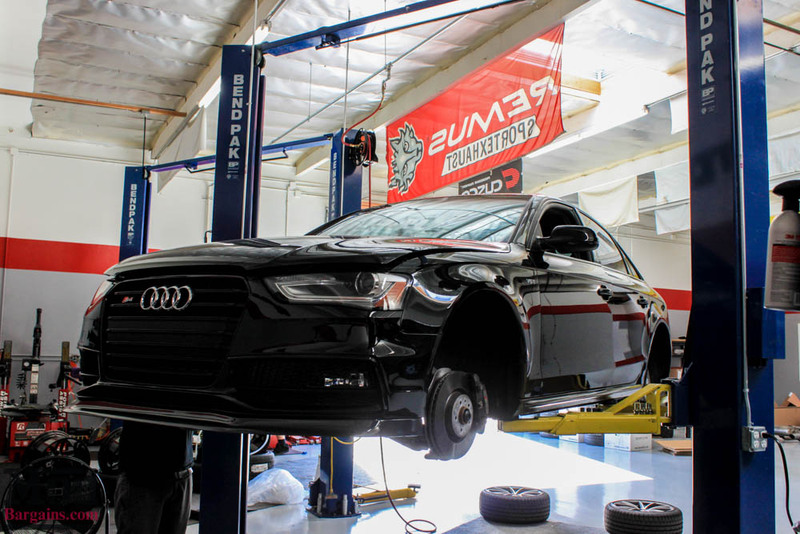 After installing the KW V3 coilovers for B8.5 Audi S4, we got the car back on the ground and the Mod Auto techs got the car set exactly where the owner had requested its ride height sit. 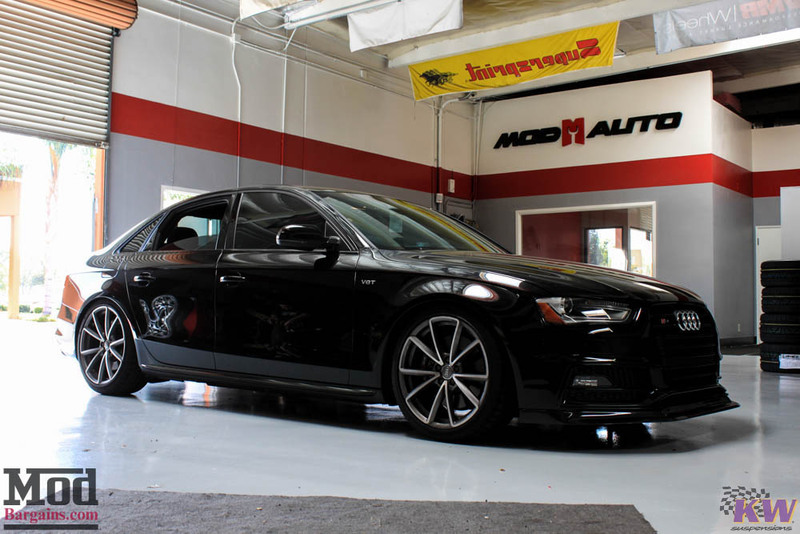 Even on the stock B8.5 Audi S4 wheels, the S4 looks great with the drop in ride height. 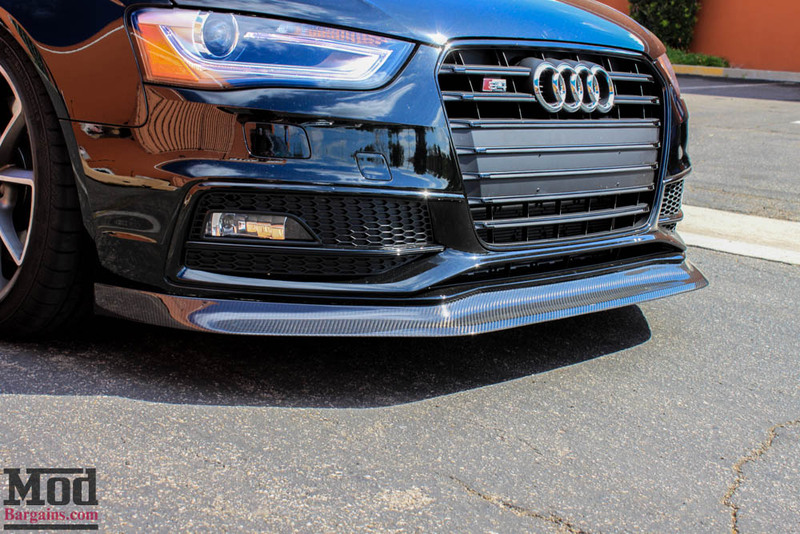 Let’s take a closer look at that Endless Carbon Fiber Front Lip for Audi B8.5 S4 from a few different angles. 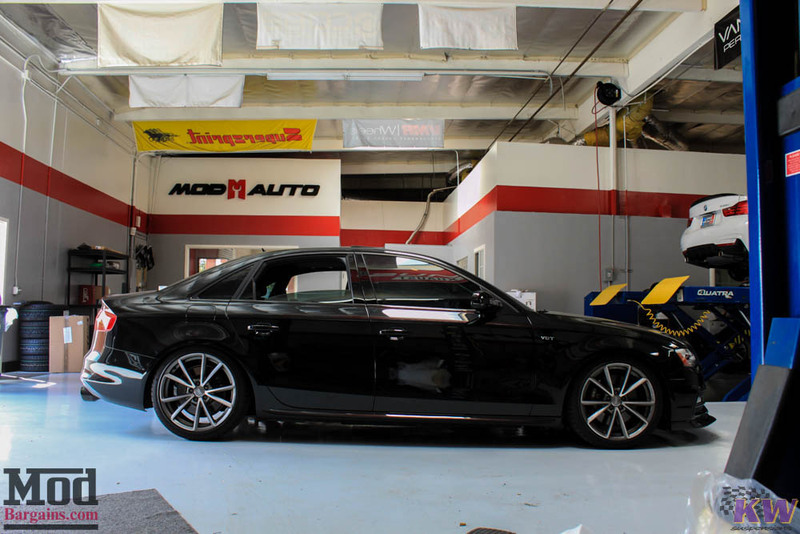 From the rear quarter view, the lowered stance adds quite a bit to the car’s aesthetic. Complimenting the blacked out look the car has going on is a subtle mod we almost didn’t notice – as we were taking the photos we noticed the B8.5 S4 Exhaust wasn’t stock – instead, a AWE Tuning Cat-Back Exhaust for B8.5 Audi S4 with diamond black tips peeks out from beneath the S4 rear bumper. 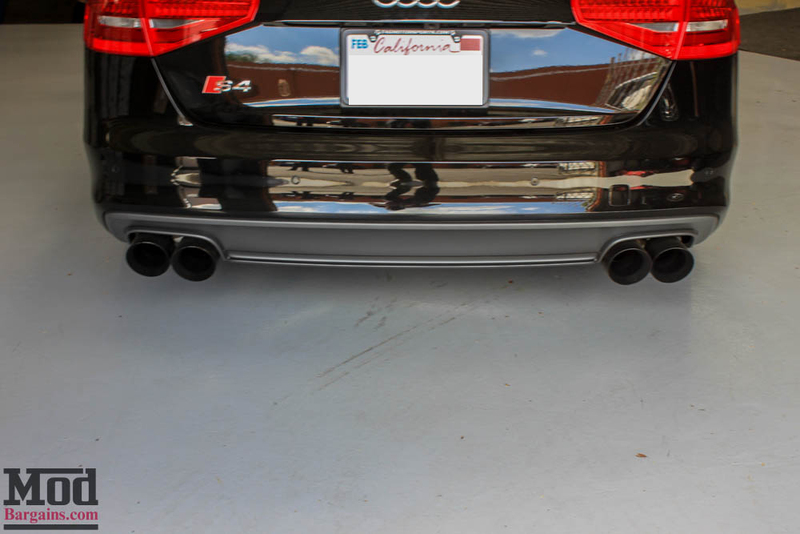 AWE Tuning‘s exhaust systems for Audi vehicles are world renowned for their high quality and extremely crisp, refined exhaust notes. 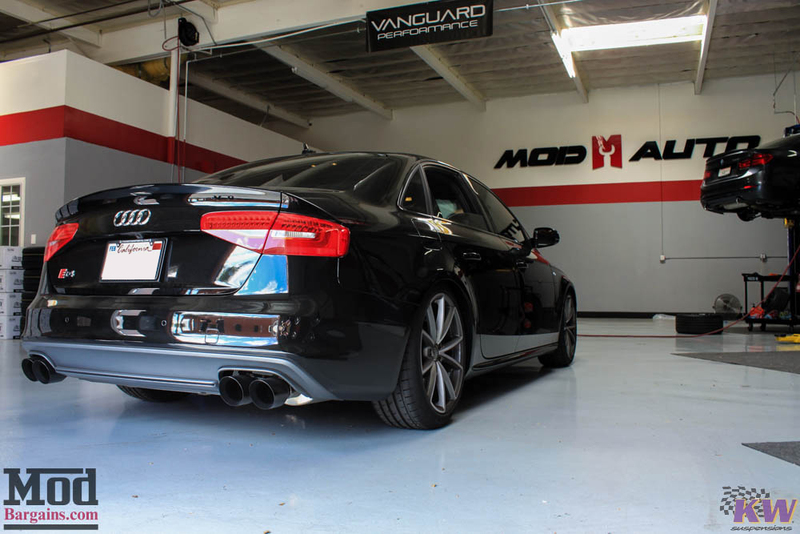 All in all, even on stock wheels, with a little help from ModBargains Co-Founder Ron, this S4 boasts a suite of tasteful mods that help it stand out from the crowd. 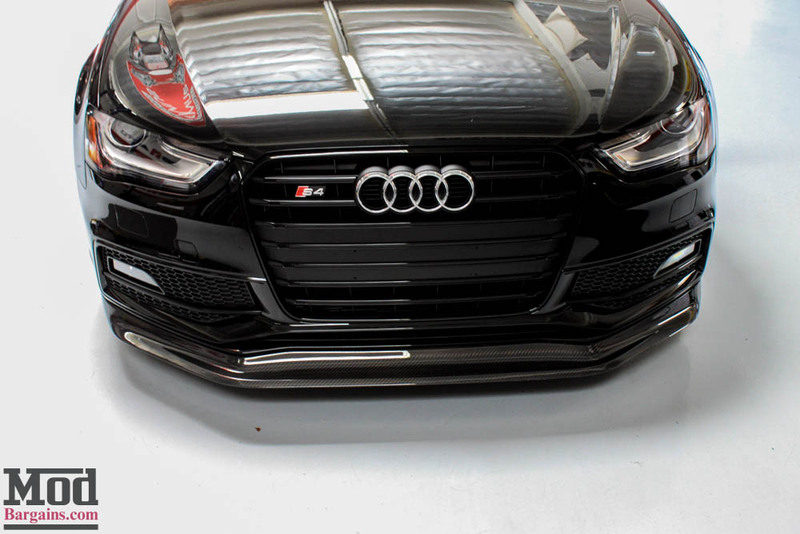 Interested in modding your Audi? 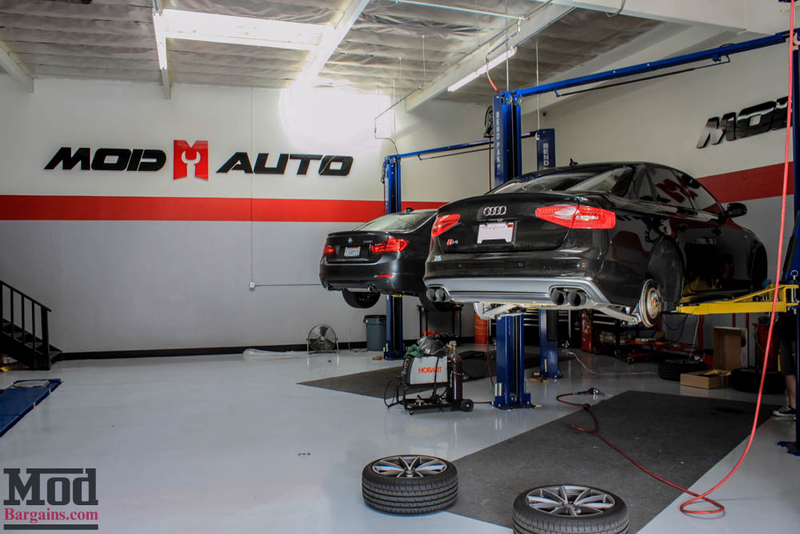 Talk to the Mod Experts at 714-582-3330 or get your modding tips from Ron himself – chat live with the experts at ModBargains.com or stop by the ModAuto showroom in La Habra CA on Lambert Rd @ Harbor Blvd any day during business hours. Thanks for reading, we’ll see you next time!